This guide seeks to explain the treatment of land use under the United Nations Framework Convention on Climate Change (UNFCCC), including requirements for reporting GHG emissions and removals, accounting under the Kyoto Protocol, and guidance for REDD+. While greenhouse gas emissions from land use have the same warming effect on the atmosphere as other emissions, land use is different from other sectors in a number of ways. As a consequence, reporting and accounting of emissions from land use has developed under the United National Framework Convention for Climate Change (UNFCCC) differently to other sectors. It has come to be seen as an arcane and complex subject, even for those who work on climate and forest issues. The objective of Understanding Land Use in the UNFCCC is to increase understanding of how human induced emissions and removals from the land sector are reported and accounted for within the UNFCCC. This Summary for Policymakers provides a high level summary of the Guide. Iversen P., Lee D., and Rocha M. (2014). 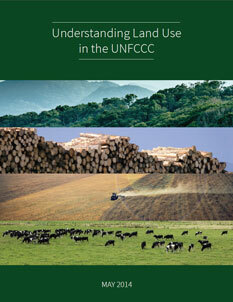 Understanding Land Use in the UNFCCC.